The months of September and October are riddled with national holidays – or red days, as they call them in Korea – which means plenty of long weekends to visit new places, as well as a lush choice in festivals to see around the country. As a last minute vacation plan, Scott and I decided to take the 4 hour bus ride to the southern tip of Korea to see Busan, the second largest city in the country. Think of it as Seoul, but with beaches. Oh, and beautiful, ocean weather. 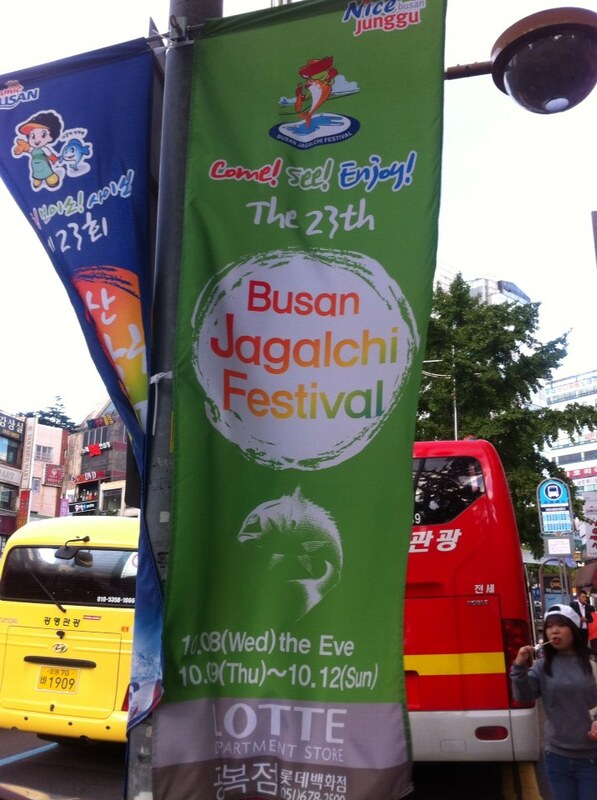 By coincidence, that weekend (October 9-12) happened to be the Jagalchi Market Festival. 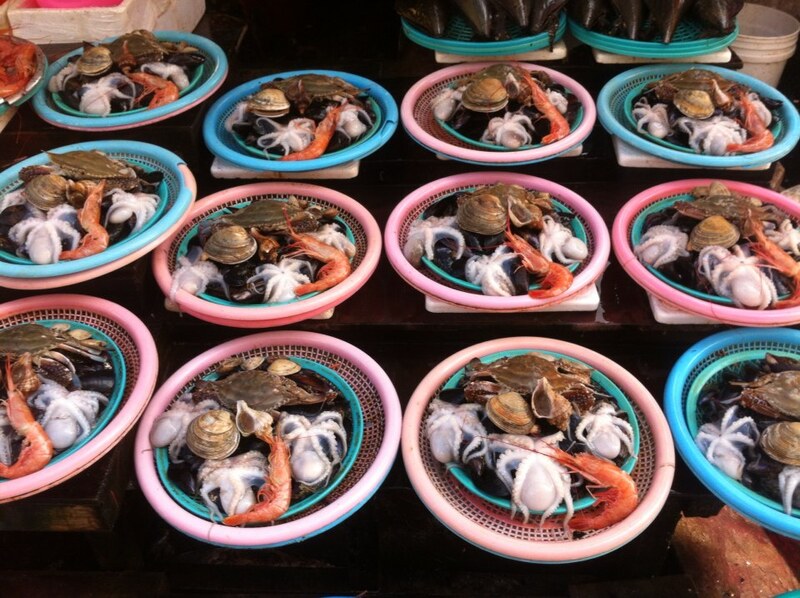 Jagalchi Market is one of Busan’s most famous attractions, and a prime subject for photography. So, with camera and film packed in our bags, Scott and I plunged into the throng. I admit I was totally unprepared for the amount of blood, slime, and scales we would find. 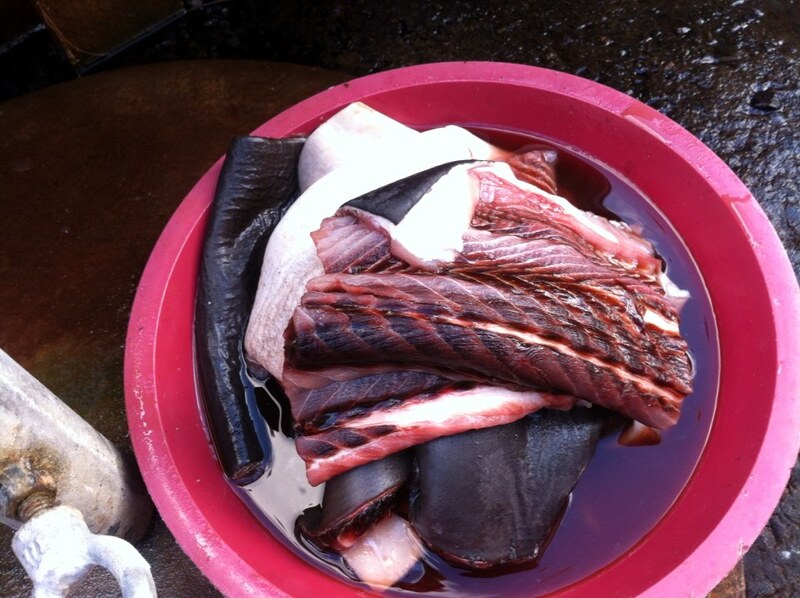 This is a market straight out of the sea, where ajummas skin eels live and display rockfish innards in the sun. 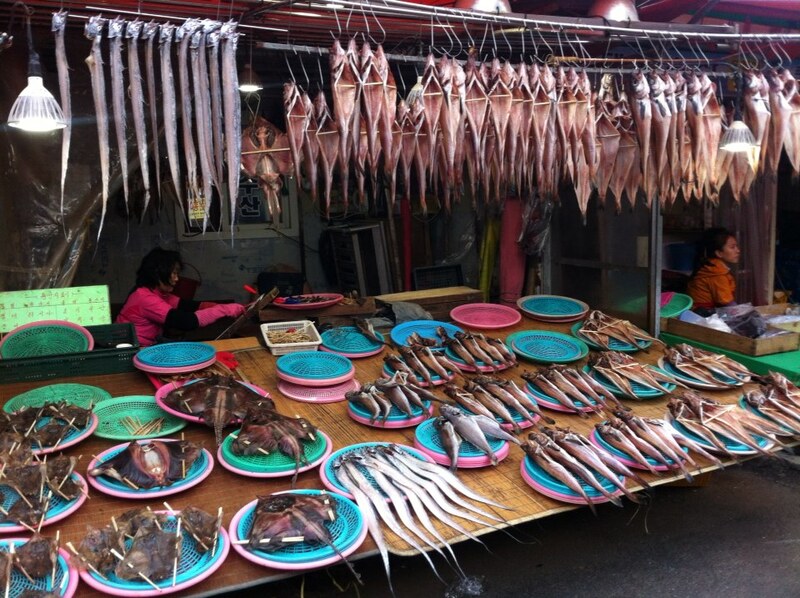 I think it might have been even worse than Hong Kong’s markets! Anyway, without further ado, where is a photo album of the experience. Grab a glass of water, and hold onto your stomachs. Animal lovers may cry. Boat docks just off the pier. 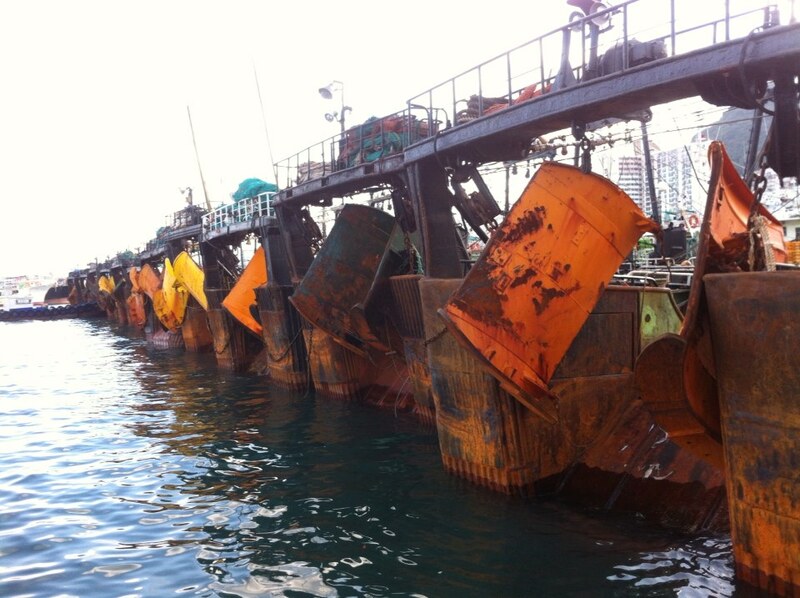 Squid still stuck to the dry, rusty slope. 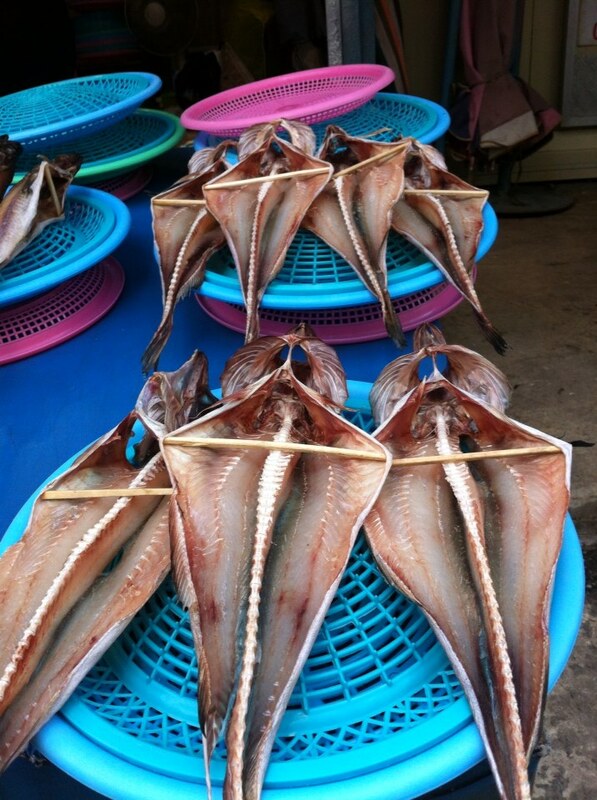 Cut eels…like wooden snake toys. Planning on making a linocut of this. Skatefish, in the ray family. They things are absolutely putrid…they urinate through their skin. 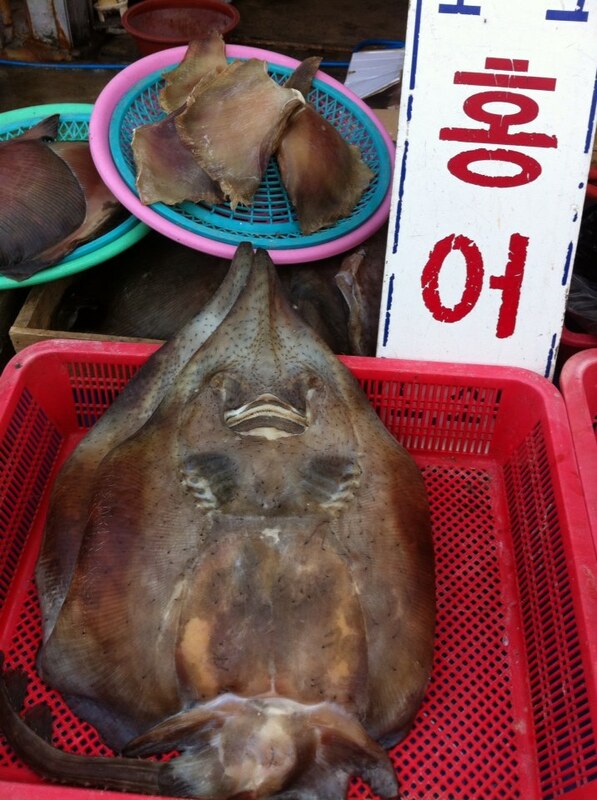 They are the key ingredient in a Korean delicacy (“delicacy”…the average person, Korean or not, would have a sore time tasting Hongeo), which is made by putting the skate fish into clay pots and allowing them to ferment in their own uric acid until they are repugnantly ripe. 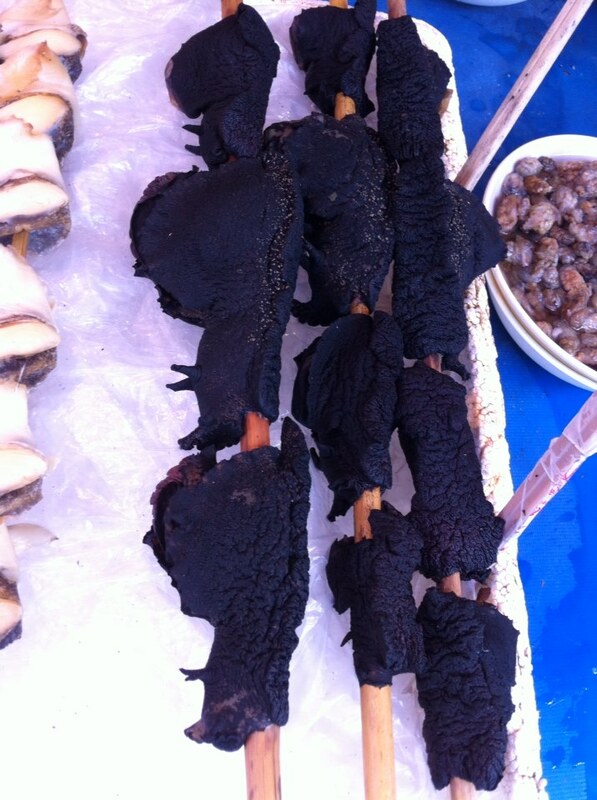 Trust me, they don’t need any fermentation to smell bad. Baring your heart to the world…if you had a heart. Resident cat. It mewled endearingly to passersby, hoping for some charity. 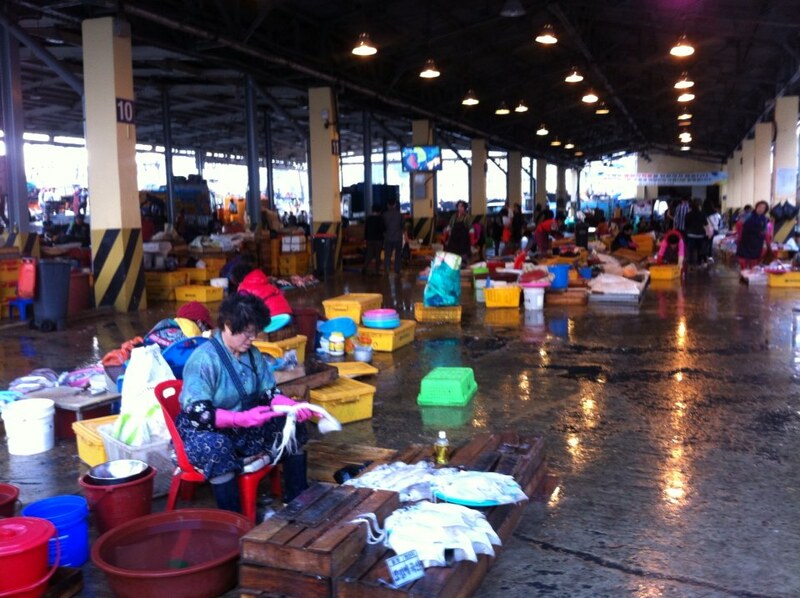 The old woman who owned the fish stall (bottom left corner) smiled and clapped her wrinkled hands. The splayed fish were my favourite subject. 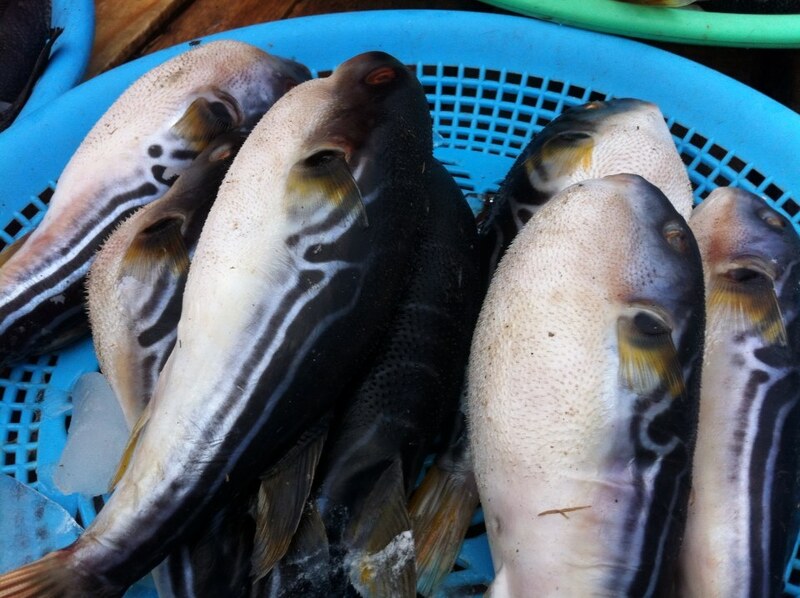 Puffer fish…the camera didn’t capture their beautiful blue undertones. 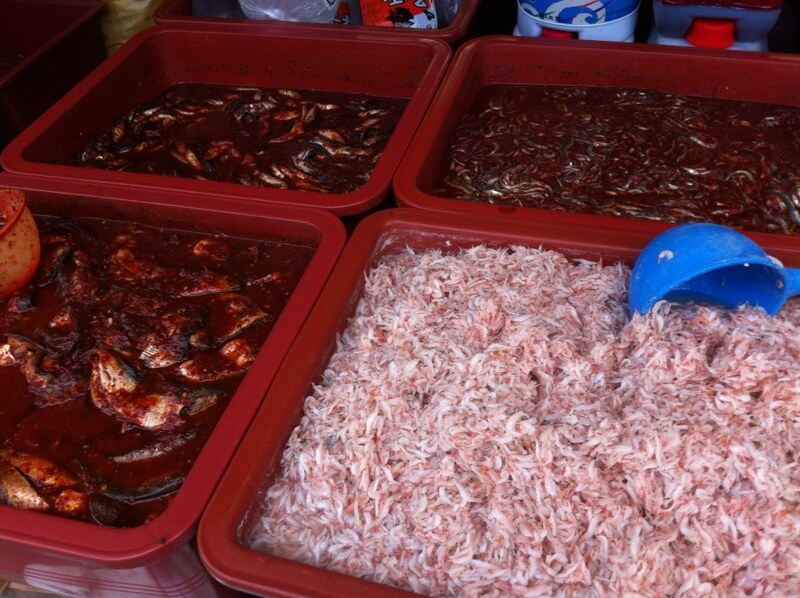 Small fish and brine shrimp in a variety of marinades. 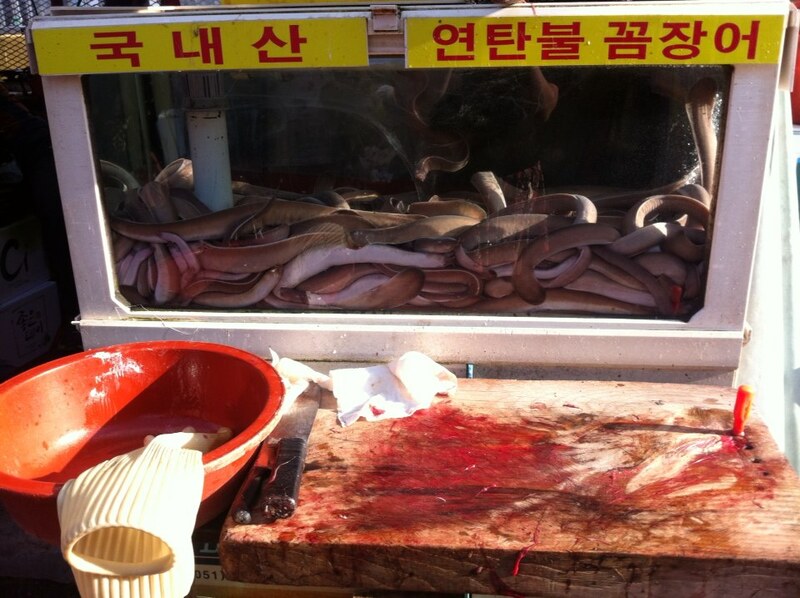 Where the deed is done: Busan’s infamous skinning of live eels. Their raw, exposed muscles writhe in blood and slime. The act. You can find many youtube videos documenting this, if you have the stomach for it. Wood chips to cleanse your eyes. 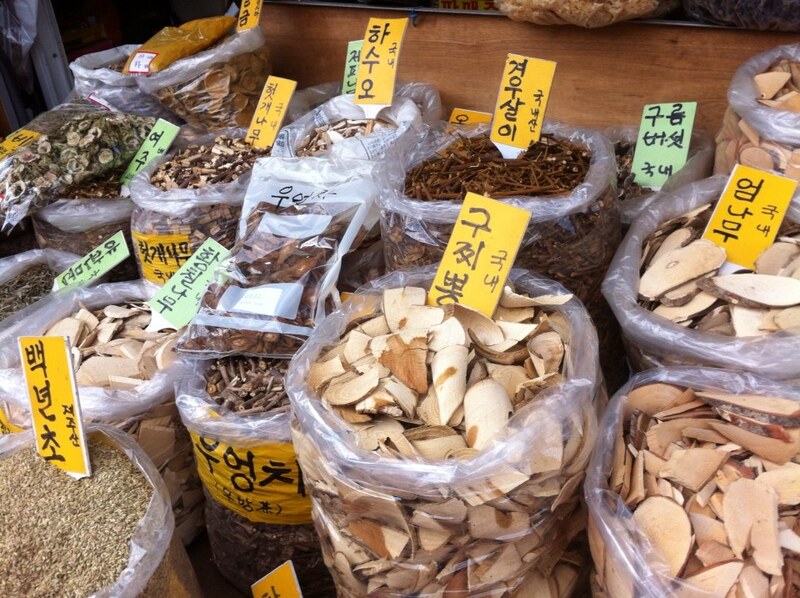 These were pungent and medicinal, like a Chinese herb shop. 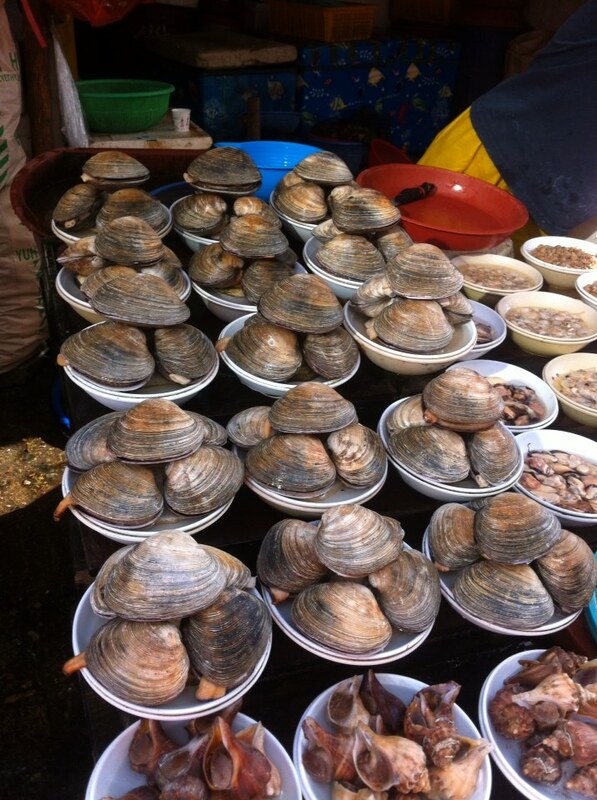 They are meant to be boiled into broths. Beautiful arrangement. Another linocut subject. Sea squirts and urchins. Usually eaten raw. There was a large alley dedicated to on-the-spot restaurants. 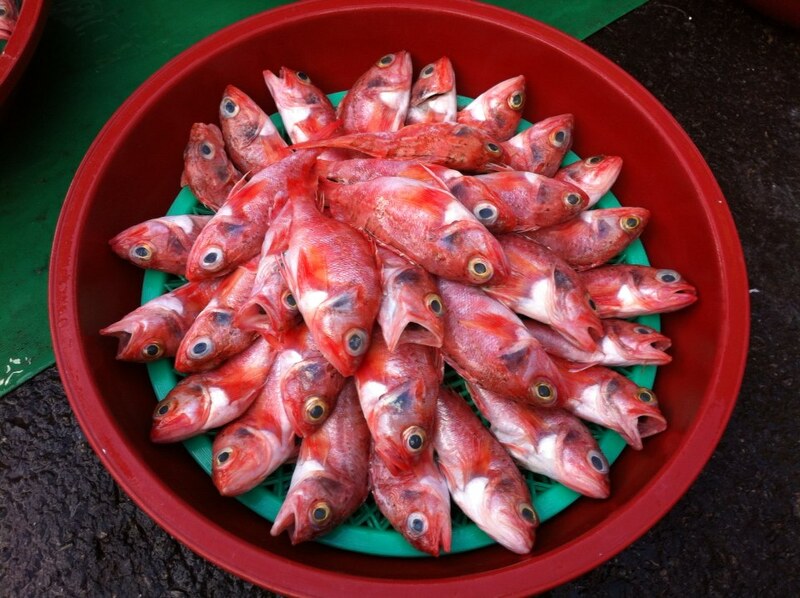 Choose from an enormous variety of fried, boiled, stewed, and seared fish. The greasy and savoury aromas flooded the wet streets. Unfortunately, we had lost our appetites for fish. 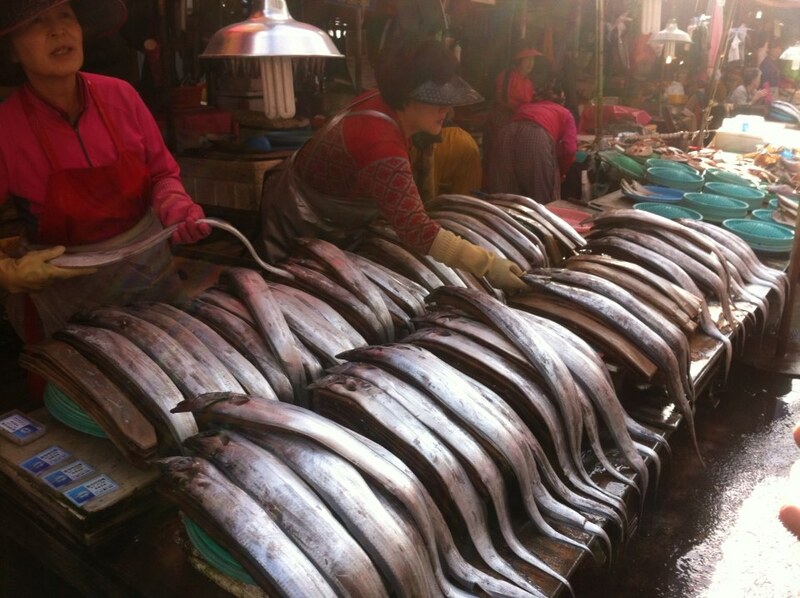 The women would re-arrange these fish tirelessly, lifting and slapping them and re-ordering them, making their tails lie long and neat. 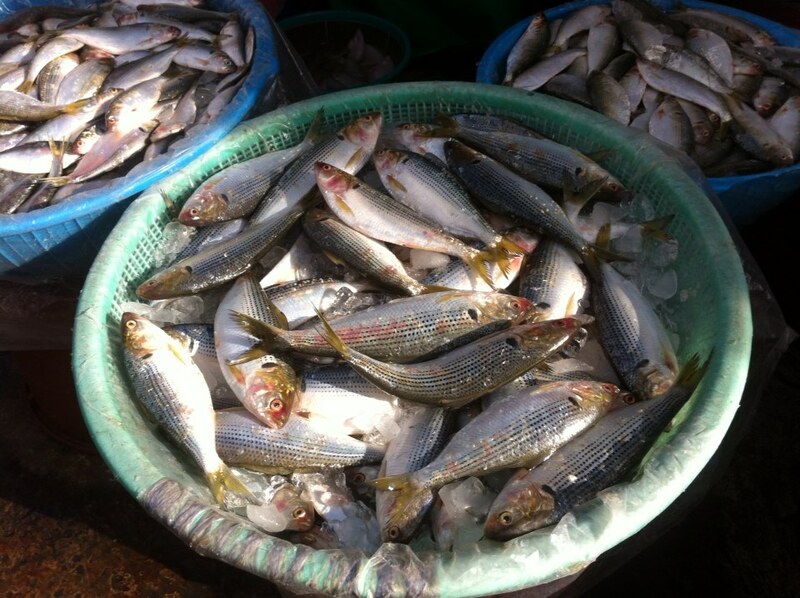 The fish were supple in their hands, like ribbons of silver flesh. They were my second favourite subject. I didn’t quite get the photo I wanted of the supplest fish. 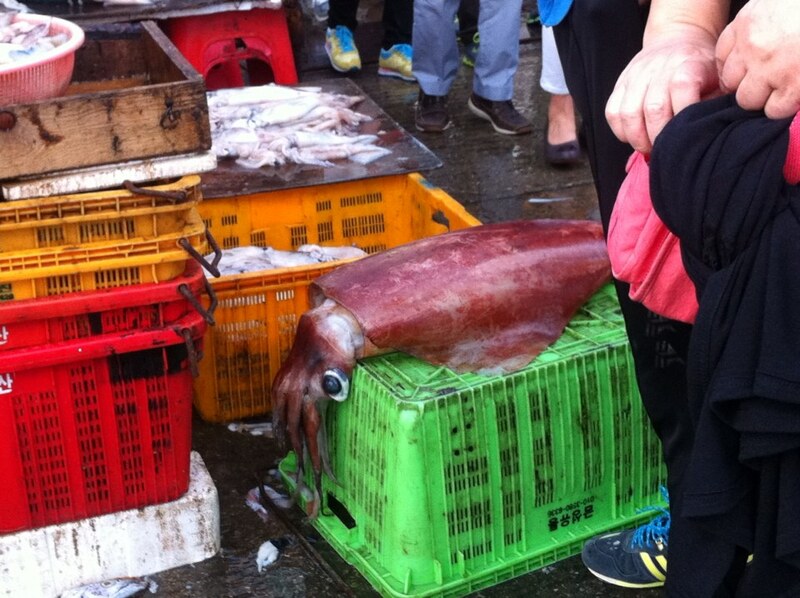 An enormous squid. The white squid are the normal size, for reference. Not the place for flip flops…we saw more than a few hapless tourists in sandals. 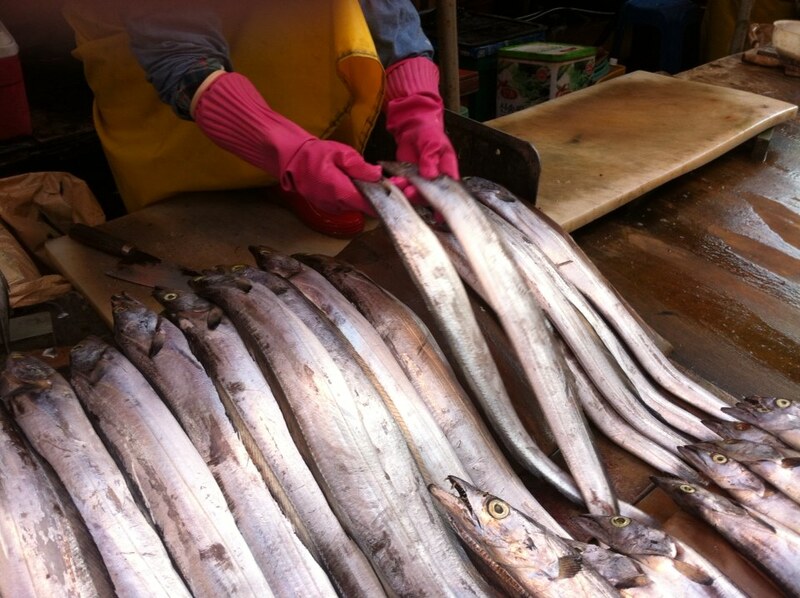 Autumn fish, Jeoneo (저너). One of my favourites when grilled. In tanks they are usually very lively and many swim upside down. 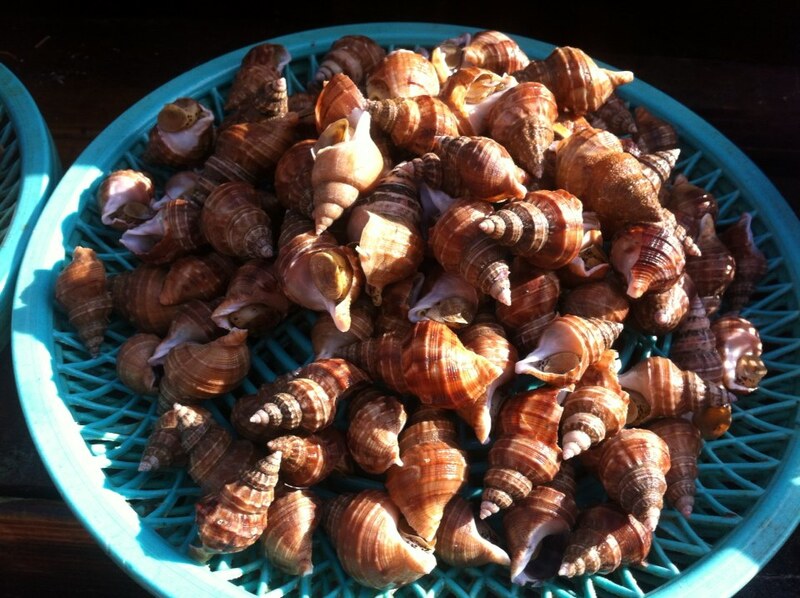 Periwinkles. 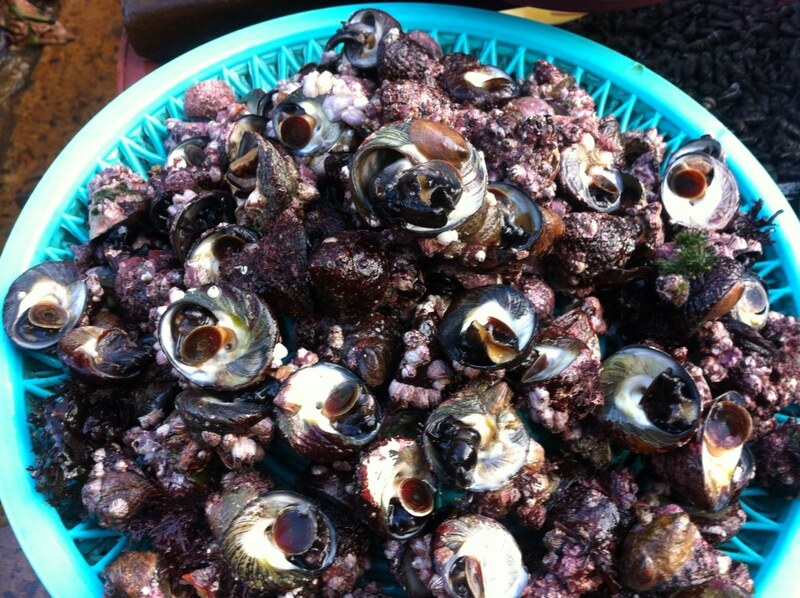 Many were still wriggling, and they had a fresh, briny aroma. Warehouse section of the market. The floor was so slick with slime that we had to abandon the venture, or else risk slipping into the freshly laid displays of raw squid. 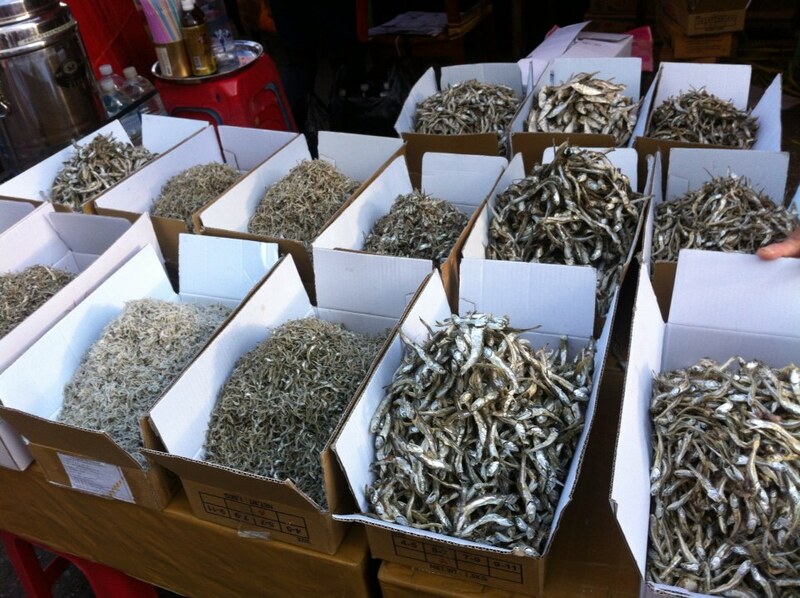 Dried fish of every size. 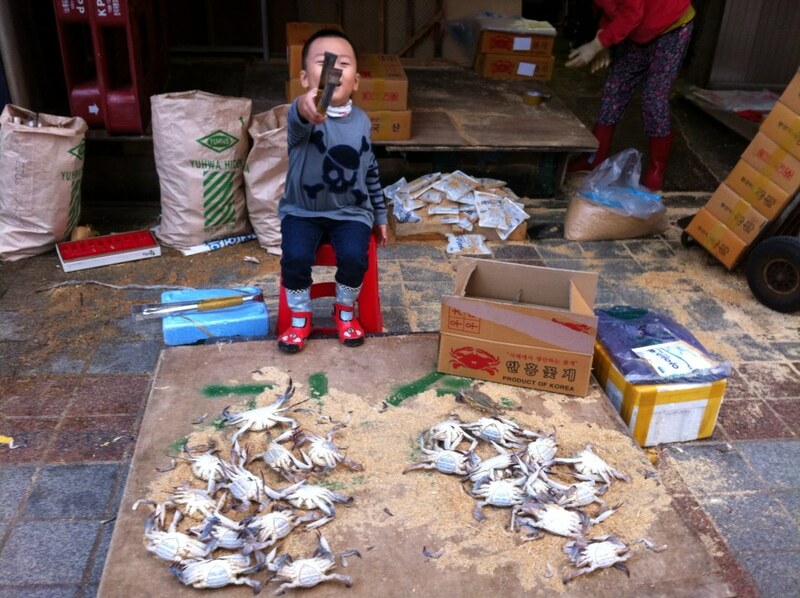 A boy manning his father’s stall. Like playing in a sandbox, only filled with crabs. 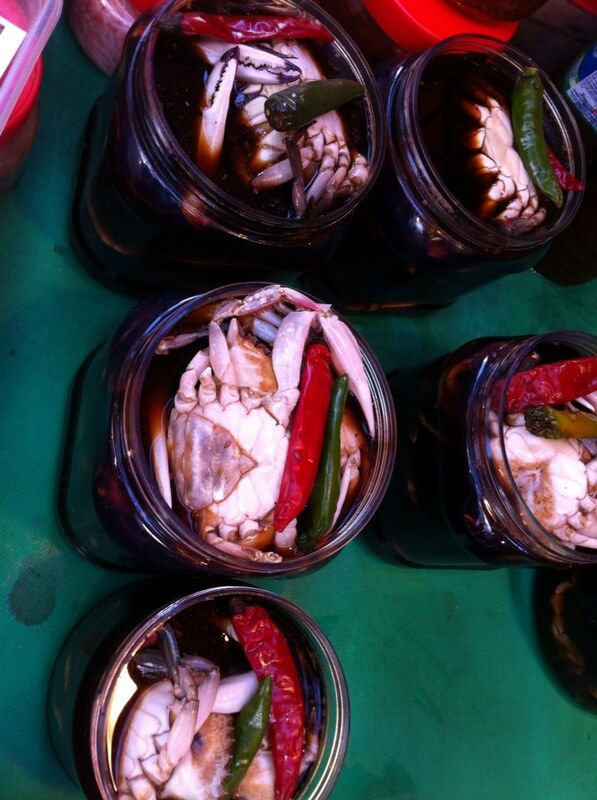 Crabs marinating in soy sauce…look delicious! 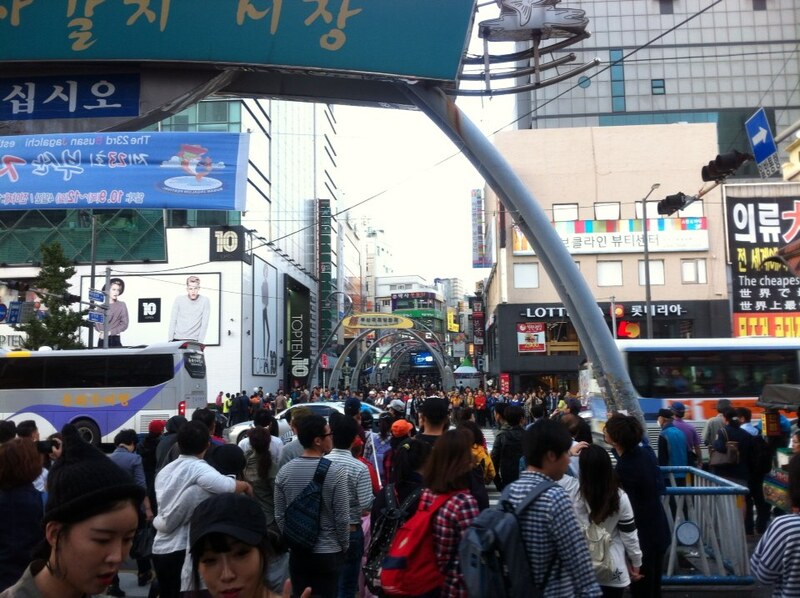 Enormous crowds…the Busan International Film Festival was taking place right outside the Jagalchi Market. 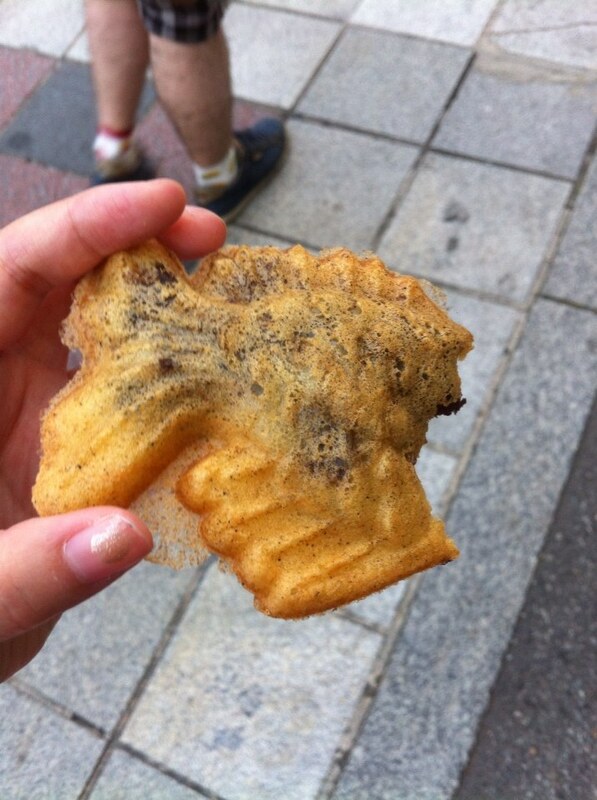 Finally…because we had lost our appetite for real fish: fish-shaped red bean cake! 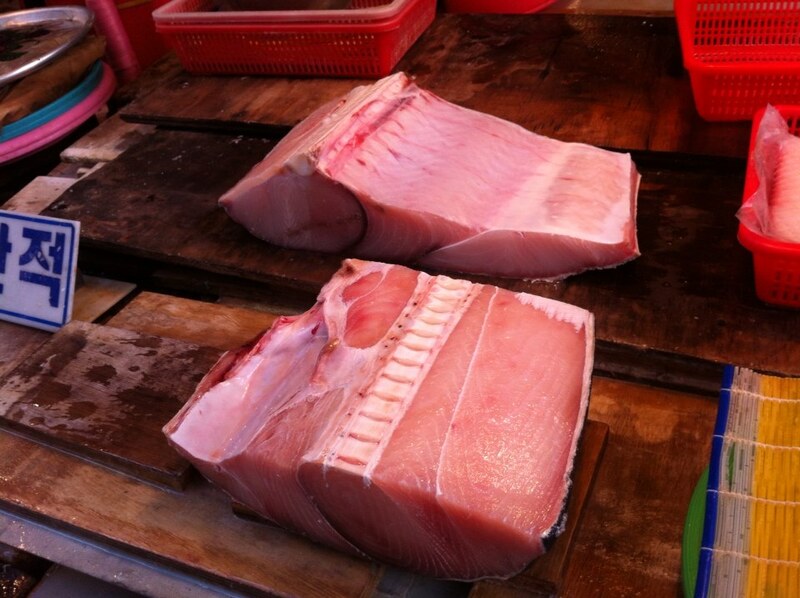 Best tour of a fish market I’ve ever had! And there might have been one or two that I would have sampled. Maybe. 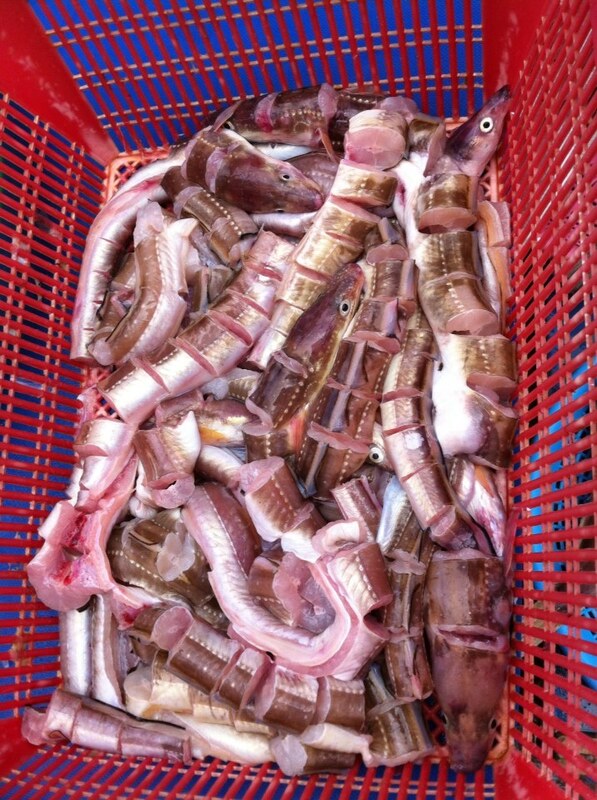 And then there were peeled eels. 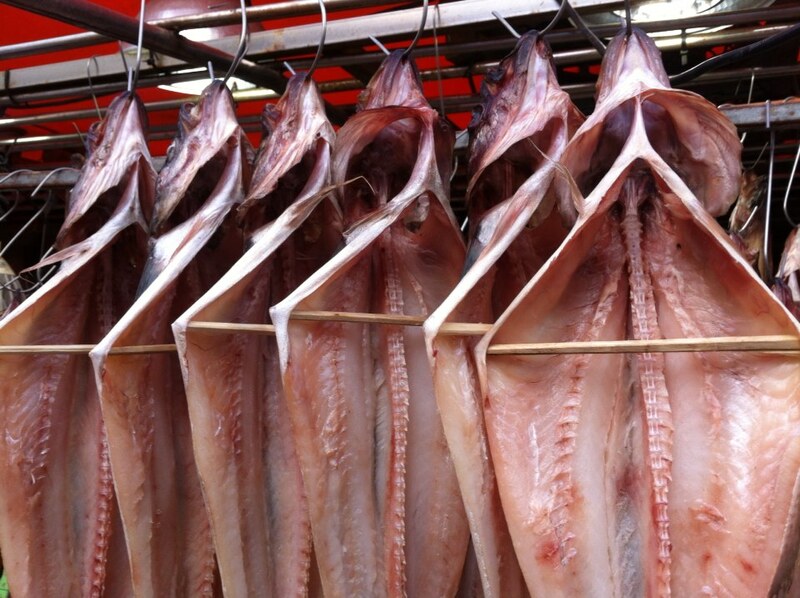 … while we real peeled eels feel freezy sea breezes, geez sneezes no longer appease us. 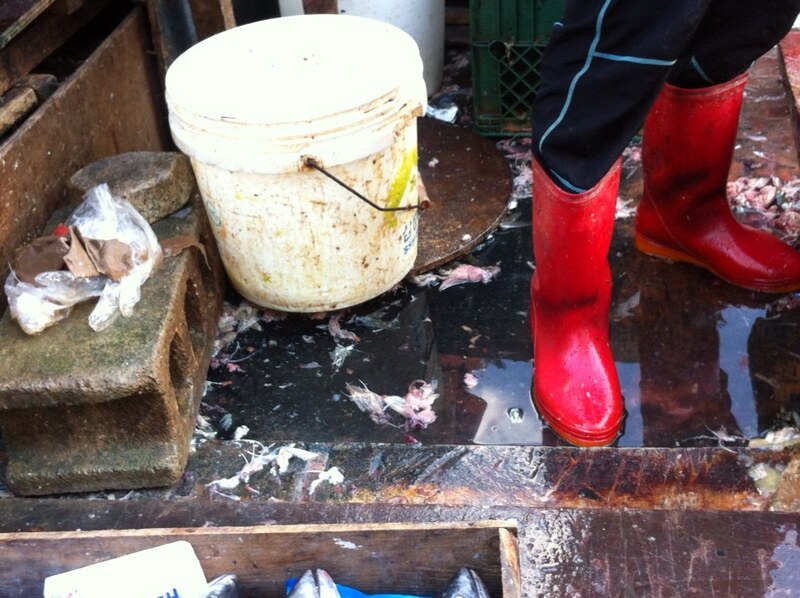 Best way to have a fish tour – minus the odour & slime. And OMG! Fish shaped bean cake! So jealous. Love the colours, the shapes, the presentations, mmm delish fish, though no time for slime. One day in the future virtual photos and videos will add the flavour of aroma a la fishmarket. I hope those lovely sneakers you wore didn’t carry the aroma for too long afterwards on your trek. So that’s one down on your (photo) bucket list, eh. Omgzzz the photos! You have a great eye, these are fantastic shots. Love the one of the ladies rearranging the silver fish. 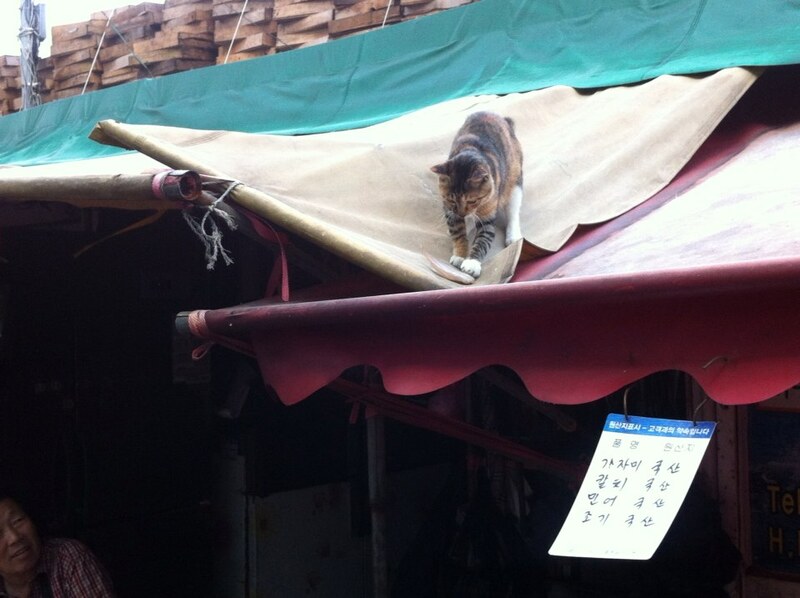 You’ve convinced me that we need to go to Busan soon.